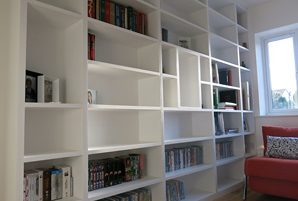 Fitted bookshelves, made-to-measure to fit any space in any room in your house. 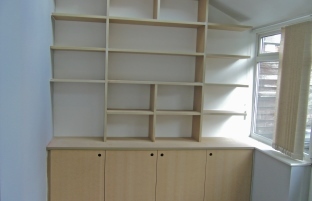 See 'Services' > 'Bookcases & shelving' page for more details or click 'Find out more' below to go to more pictures in the Gallery. Wall-to-wall storage, shelving, wardrobes, cupboards designed to fit any room in your house. JL Joinery provides advice on appropriate materials to suit traditional or contemporary styles. 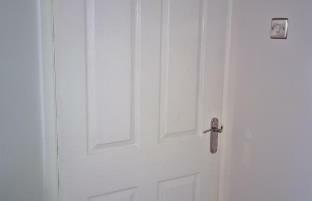 Internal wooden doors from only £85. Door shown is a four panel white moulded door with door fittings, mortice latch hinges, handles and labour, priced at £85 per door. Other styles & fittings available, priced separately. Joiners or carpenters, what is the difference? Carpentry and joinery are used interchangeably in woodworking trade, but traditionally they are two separate specialisms. Technically, a carpenter will create, install or fix at your house what a joiner makes in their workshop – made to the specification you ask for. These days, joiners finish and fit bespoke joinery such as bespoke fitted cupboards and fitted wardrobes, not just cutting and fitting joints, and many of these tradesmen work both as joiners and carpenters. For the purposes of what you need, just look at the list of services and the chances are either a joiner or carpenter will be able to handle any job, from measurement to fitting, that involves wood! How do I know JL Joinery is the right joiner for me in Leeds? As with any trade, you will want to check out their experience on similar projects in the Leeds area of West Yorkshire. You will see on the Work Examples page and the recently launched Showcase page examples of bespoke joinery that JL Joinery has installed, including internal wooden doors, fitted wardrobes even gazebos and playhouses. As a joiner with many years of experience in Leeds, you can have the confidence, whether a one-off single joinery project, or for regular enhancements to your home, JL Joinery has been the first choice for hundreds of homes in the Leeds area of West Yorkshire. Internal wooden doors inside the home to gates and fences for your garden, JL Joinery has it covered. JL Joinery has built a reputation as a skilled local joiner / carpenter with impressive attention to detail, and over 40 years of experience, giving customers peace of mind on joinery / carpentry work. Estimates are free within a reasonable locality (West Yorkshire), and references / testimonials are available on request. Give us a call today to discuss your joinery project.